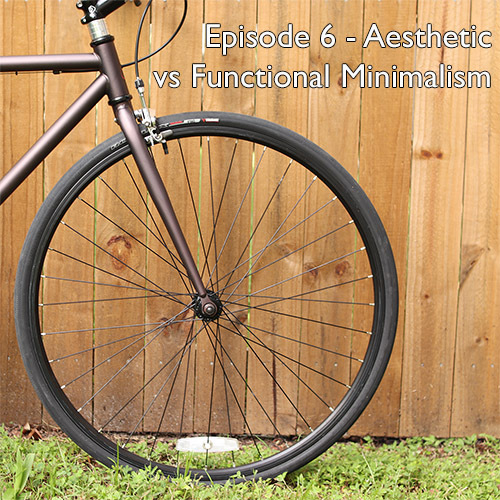 This episode covers the big, hairy, nasty topic of aesthetic minimalism vs functional minimalism. In short, there’s a big trend for selling things that look very sleek and minimal, but in practice are actually much more complicated and difficult to live with. For example – that touch screen on your car’s dashboard has a lot of technology, but actually requires you to take your eyes off the road much more than car stereos from 20 years ago because you can’t feel any buttons with your fingers (it’s all on a flat screen). It LOOKS minimal, but isn’t very minimal in the real world. We discuss one area that this has affected the bicycle business in-depth, which is the near-ubiquitous trend for routing the shift and brake cables inside the bike frame (rather than externally). While this can make the bike appear to look more minimal, many beginning cyclists don’t know that it makes repairs and service significantly more difficult and expensive over the long haul. 1. If at all possible, shop for bikes that have external cables. If your bike dealer ONLY has bikes with internal routing, ask if they have a particular model that’s easier to service and own. 2. On the high-end of the marketplace ($$$), SRAM has wireless electronic shifting, which eliminates the need for routing any shift cables at all (though you do have to charge multiple batteries).